Shriekfest 2011 was pretty epic. I bet it wasn't always filled with such great movies, but now that they get hundreds every year (and can only show a small fraction of them), most of the bad ones are never seen by the crowd. Some of the shows were pretty breathtaking and suspenseful. You might expect a monster to pop out, but instead the camera just stays black... until you finally realize the person you were watching is, officially dead. It's quite awesome the way some of these films do a great job with emotion. 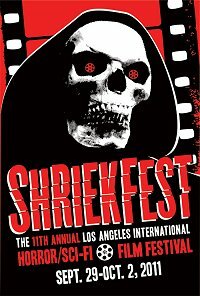 If you go to Shriekfest sometime, I hope I see you there!